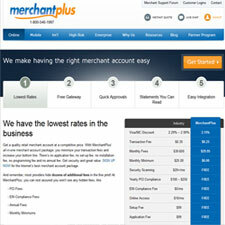 Merchant account services and payment services from MerchantPlus offers a low rate, flat free option for processing charges. MerchantPlus offers a suite of services, PCI compliance, and boasts no annual fee, no application fee, no setup fee, with no minimum transaction fee per month. In addition they have secure payment options for online transactions, point of sale terminals, and phone transaction services. Located in New York, MerchantPlus is a company fighting to be known as the lowest rate credit card processing service provider online. In addition to providing a strong service suite to the online payment processing for businesses, Merchant Plus works flexibly with 501c3 non-profit companies offering special rate considerations for these companies. UPDATE: Use Coupon Code – ARIEL – when applying for an exclusive 20% merchant account discount with Merchant Plus, act now to secure your 20% discount for your businesses credit card payment processing.